William Mattar Law Offices logo goes pink for October and the firm plans unique fundraising activities to combat breast cancer. This is a great way for the firm to support the October breast cancer awareness crusade. As a staff member and cancer survivor, it’s been wonderful to see William Mattar ‘go pink’ along with community support and fundraising. The William Mattar Law Offices blue logo goes pink in a big way to support the fight against breast cancer during the month of October. The motor vehicle accident law firm that focuses on helping those seriously injured after car and truck accidents will go pink across the board on their website, television advertising, and social media. William Mattar will be represented at the Making Strides Against Breast Cancer walk in downtown Buffalo at Canalside on Saturday, October 14, 2017. Their team, “Supporting What Mattars,” will be comprised of staff, friends and family. The fundraising is also being taken to a new level this year as members of the William Mattar Wellness Committee plan creative in-office fundraising activities. An “Escape Room” event is putting some fun in their fundraising. “This is a great way for the firm to support the October breast cancer awareness crusade. As a staff member and cancer survivor, it’s been wonderful to see William Mattar ‘go pink’ along with community support and fundraising,” said Dawn Raub, assistant to William Mattar. The American Cancer Society’s annual Making Strides Against Breast Cancer walk unites communities and raises funds nationwide towards early detection, prevention, support, and research for new treatments as they work towards a cure. William Mattar Law Offices not only goes pink and joins in fundraising, but also has a website page dedicated to Western and Central New York resources in an effort to raise awareness, educate, and provide help for patients and their families. 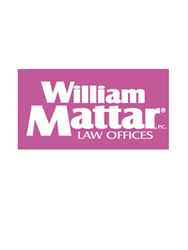 Founded by William Mattar in 1990, the firm helps those seriously injured in car, truck and motor vehicle accidents. In addition to the Go Pink Breast Cancer Awareness campaign, the firm stays actively involved in community events and has established a number of programs and initiatives such as the William Mattar Buckle Your Belt Campaign, Pencils 4 Schools, Rescue a Shelter Animal and the William Mattar Safe & Sober Free Ride Home Program. Fostering a culture of community and family, the firm has been named to the Best Companies to Work For in New York State for 2017. Learn more about what to do after a car or truck accident with serious injuries or William Mattar's positive community impact by visiting http://www.williammattar.com or call (844) 444-4444.